We all know what a prescriptivist rant sounds like: after all, there’s a lot of them about. A descriptivist rant is a much rarer thing: after all, descriptivist linguistics is a flexible, observational and forgiving discipline. But they do exist, and some of the best I’ve ever read have been by Geoffrey Pullum, professor of general linguistics at Edinburgh University and one of Language Log’s greatest eminences. The subject of several of his rants has been that old favourite, the distinction between “which” and “that” – specifically the idea that “which” must introduce non-restrictive clauses, set off with commas, that are parenthetical to the sentence, and that “that” must introduce restrictive clauses, without commas, that define (or “restrict”) the item that has just been mentioned. “Grammar snobs trying to show off their linguistic rectitude by playing gotcha with an invented rule that never matched educated usage; copy editors slaving away trying to enforce it; Microsoft Word blindly putting wavy green underlining under every relative which not preceded by a comma. What a senseless waste of time and energy. Linguists who are able to take a calmer view of the matter than the professor (who also wrote another post on a similar subject entitled “More Timewasting Garbage, Another Copy-editing Moron“) explain that, in fact, it is the presence or absence of the commas that makes the crucial difference. 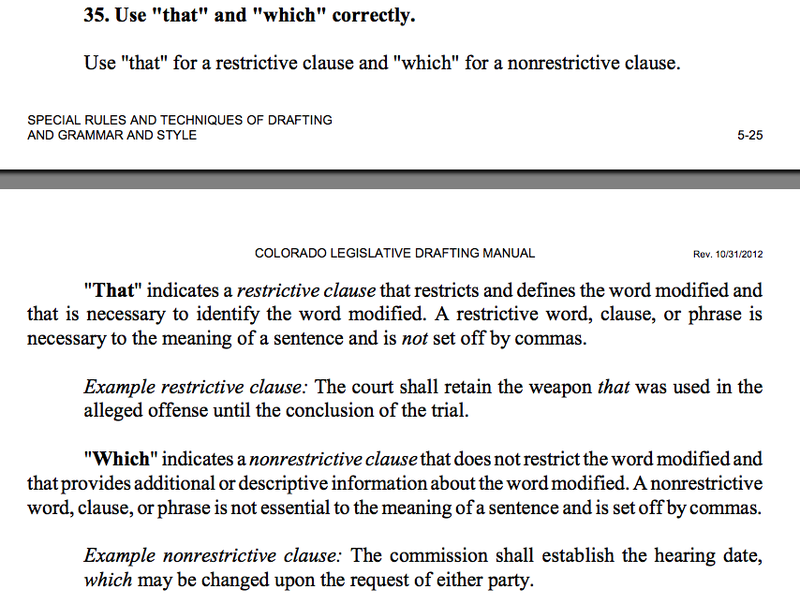 You can use “which” for a restrictive clause without making it non-restrictive, as long as you avoid commas. There’s no doubt that the linguists’ case is a convincing one – not least because of the large corpus of English that precedes and contradicts Fowler’s efforts to introduce the distinction. But nonetheless, his idea has spread. 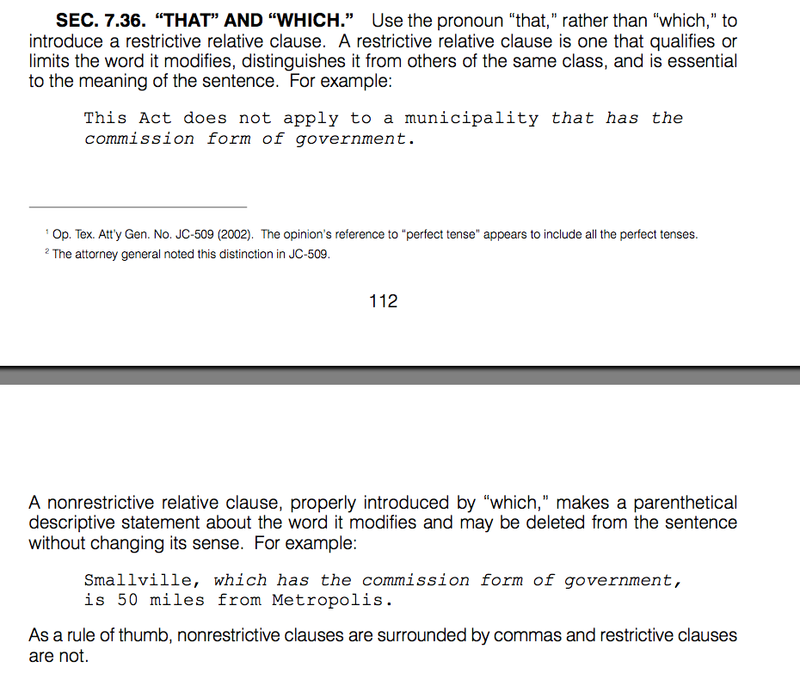 And not just to the subs’ desk, or even Microsoft’s grammar checker, but even further – to the state capitol. “As a rule of thumb.” Ouch. Fowler’s suggestion may not be strictly necessary for comprehension, but if you follow it the way he drew it up, it won’t get you into any trouble. However, if you don’t grasp the rule fully – and, on the face of it, Texas and Massachusetts don’t – it might be a different matter. 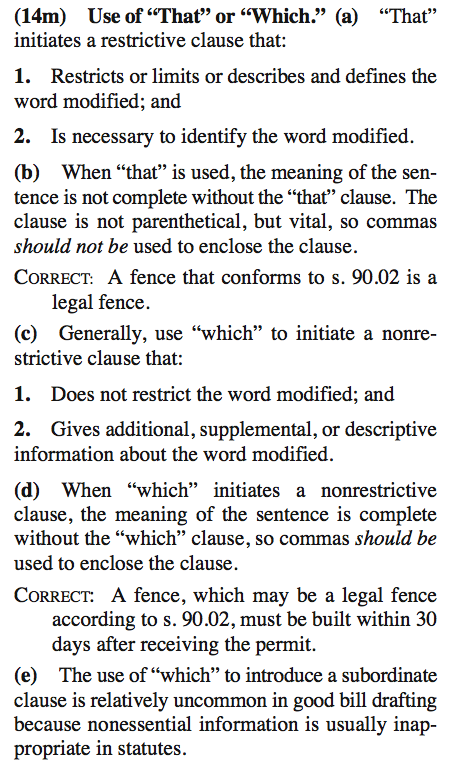 By ignoring or downplaying the role of commas, it’s at least theoretically possible that a “which” clause somewhere in the statute book that was intended to be non-restrictive has become restrictive, and changed the meaning of a section in a bill or an Act. Not very likely, perhaps, and you’d need three spare weeks and a Westlaw account to look for it. But it makes you wonder. *Ambiguity, for example, like this. 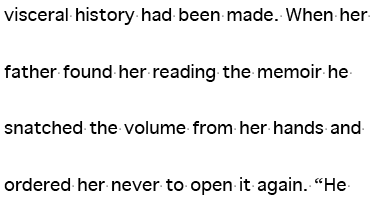 This is a post to echo a good point that’s been made at HeadsUp repeatedly in the past few years: that there’s a lot of hidden or implied maths in historical stories that can be checked. 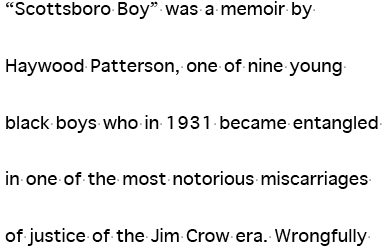 Not just, say, the simple recalculating of percentages in financial copy, but the more difficult-to-spot progression of dates in a timeline, or perhaps the comparison of a biographical piece against the fixed historical dates it mentions. There’s quite a lot of data there: enough, in fact, that the information can be plotted on one timeline that ought to take us from the incident itself to the present day. But it doesn’t. Not quite. The incident happened in 1931. 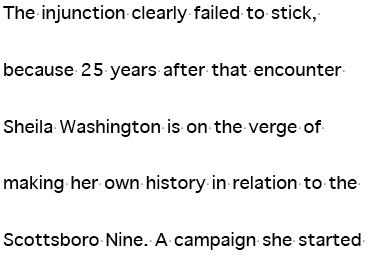 “Almost three decades later”, the copy says, Ms Washington was born. Let’s say three decades exactly, to make it easier; that would be 1961. 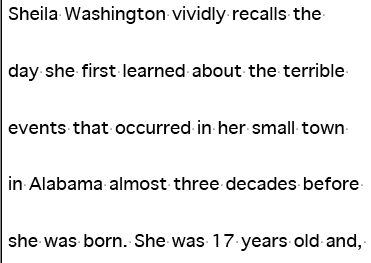 So when she was 17, it would have been 1978; but “25 years” after she found the book only takes us to 2003. Ten years have gone missing somewhere. Time to email the author. This causes a bit of a problem, as you might imagine, when it comes to Queensrÿche. WordPress can manage it, but not every font or character set will let you put a diaeresis over a y. Perhaps it’s just as well that the Pacific Northwest music scene isn’t the global news phenomenon it used to be. The heavy-metal umlaut is of course one of the few diacritical marks that makes no difference to the sound of the vowel it modifies. It’s quite fun to imagine what would happen if it worked like a conventional umlaut: MOERtley CrOER. MotOERhead. But then, as my colleague Phil points out: how on earth would you pronounce Queensrÿche? One of the things we talked about a few weeks ago when the Science Media Centre came to visit was the Andrew Wakefield MMR controversy, which seems to be back with a vengeance this weekend. Even after having his controversial paper linking measles vaccines to autism withdrawn by the Lancet some years ago, and subsequently being struck off, Wakefield is again being given space in the papers to explain himself even as the measles outbreak that many blame him for spreads. Everyone in the media now knows that his work has been discredited, and can see the potentially tragic consequences of his campaign. But we just can’t seem to let it go completely. Why is that? The SMC press officers weren’t surprised that the media got excited when his paper was first published in 1998: how can you expect the papers to ignore a major study under the imprimatur of the Lancet? But as the controversy and questions over his work grew – long before 2010, when the paper was finally withdrawn – they couldn’t understand why some journalists obstinately stuck with him. But I think I understand. The impression I get is that scientists, who are even-handed, evidence-based and impartial in their work, think that journalists are the same: but they aren’t. Reporters are romantics. They don’t get into journalism to magisterially weigh the evidence; they want to use the power of the media to redress injustice and battle powerful lobbies – to fight for the weak against the strong. This is most clearly seen in consumer journalism, of course, where, if it emerges that a reader’s complaint against a big company has no foundation, the whole investigation is simply dropped. No one runs “Tribune reader attempts petty fraud on multinational” stories in the consumer pages. If the strong are in the right, there’s no story. But that guiding principle gets particularly tricky in specialist subjects. Science reporters, especially, can’t possibly know as much about the subject as the researchers in the field; so they replace that knowledge gap with that combination of suspicion, compassion, cynicism and inquisitiveness known as “news sense”. Confronted with something like the thalidomide scandal, they don’t understand the in-utero biochemistry, but they see a pharmaceuticals company with a “wonder drug”, a series of personal tragedies for families, some high-profile dissidents in the scientific community – and they start to wonder. And the instinctive romantic’s support for the outsider also comes into play. The parallels aren’t exact, but if you compare the treatment of the now-discredited Wakefield and the now-vindicated 2011 Nobel chemistry prize winner Dan Shechtman, in a certain light they look very similar. Shechtman was an outlier for years in his belief in the existence of quasicrystals: the great Linus Pauling rebuked him publicly and repeatedly (“There is no such thing as quasicrystals, only quasi-scientists”) to the extent that he was almost fired from his job. It took years and years to bring a hostile scientific community round to his point of view. But he was right all along. At the start, Wakefield seemed to have all the same characteristics of the courageous loner. Add in the thalidomide-like elements of personal disasters for families on one side, and Big Pharma making money on the other, and the combination was simply irresistible for the press. Of course Wakefield was being rubbished, the thinking went; isn’t that how the scientific community deals with its dissenters? Isn’t that what pharmaceuticals PRs are paid to do? It took years of patient research rebuttals and damning revelations against Wakefield himself, and the complete withdrawal of all official backing for him in 2010, before most of the media got the message. We never normally need to be judicial; on the one occasion when we really needed to be, we couldn’t manage it, or at least not in time. And some people still can’t. Three-parent babies eat Frankenstein meat! A few weeks ago, we got a visit in the newsroom from some scientists who wanted to shout at us. Well, not quite: in fact, they were press officers from the Science Media Centre, an organisation that “works to promote the voices, stories and views of the UK scientific community to the news media when science is in the headlines”, and they were very friendly. But they were worried about the kind of language that journalists use “when science is in the headlines”. You know the kind of thing: “Trials of GM crops bring new fears of ‘Frankenstein’ food“. “Could Chinese herbs and coffee cure cancer?“. We came in for our fair share of both praise and criticism. As the SMC saw it, tabloids and broadsheets both seemed to swing between responsible reporting and outrageous sensationalism almost by the day, with, on occasion, the redtops doing a more even-handed job of reporting a new breakthrough than the more august papers. We had a lively exchange of views about a lot of subjects; it wasn’t just a lecture. The SMC were interested to talk to subs and section editors and find out what happens to a story after it enters the production process. The SMC, because they are neither active scientists nor working journalists, are happy to tread the middle ground between researchers’ grumpiness about trite phrases and subs’ need to write headlines in small spaces. Some scientists object to the phrase “three-parent babies” used in connection with injecting donor DNA into embryos to cure mitochondrial disease. The SMC told us that they were grumbling: “It’s only a tiny bit of material”. Our regressive hack’s headline-writing instincts aroused, we said: yes, a tiny bit of material … from someone else. State the source of the story – eg interview, conference, journal article, a survey from a charity or trade body, etc, ideally with enough information for readers to look it up or a web link. Give a sense of the stage of the research – eg cells in a laboratory or trials in humans – and a realistic timeframe for any new treatment or technology. Remember the patients: don’t call something a “cure” that is not a cure. *Of course, quotation marks should not be used to dress up overstatement in any headline; that’s not what quotation marks in headlines are for. Here’s a bear trap of an an error that I’ve stepped right into myself in the past. It flies the same flag and plays the same anthem as the European Union, but the Council of Europe is not to be confused – if you can help it – with the European Council or the Council of the European Union, both of which are EU bodies. It also has a commissioner, who is not to be confused with an EU commissioner from the European Commission. The whole thing can be a nightmare if you’re having to rush through copy written by someone who isn’t a specialist. The two most dangerous words to read in European news copy are “council” and “court”, at which point it’s a good idea to stop dead and think: which one? Council of the European Union. Part of the EU; can be usefully thought of as the “upper house” of the European Parliament. Often known as “the council of ministers”, which can help to alleviate confusion. European Council. Part of the EU, this is the high-level direction-setting forum attended by all the EU’s heads of government and other notables, led currently by Herman van Rompuy. Powerful, newsworthy and influential. European Court of Human Rights. Not an EU institution, but the most high-profile body of the Council of Europe. It exists to rule on matters arising under the European Convention on Human Rights, passed in 1950 and signed by all 47 member states of the Council. Stories about “article 8 rights to privacy” or “article 10 rights to expression” – much in evidence in the current debate on UK press regulation – refer to articles of the human rights convention, and are therefore not “stories about the EU”. I don’t know why I find this so difficult – perhaps because of years of subliminal exposure to undifferentiated tabloid bludgeoning about “Brussels” and “Europe”. Anyway, I’m now almost as cautious about editing EU news as I am about pre-trial crime stories. UPDATE: As Estelle Wolfers notes in her comment below, there has been a further wrinkle in the EU court system since 2009 and the Lisbon Treaty; there is now a two-court system. As she says, “the Court of Justice of the European Union” – the now-correct phrase – “encompasses both the Court of Justice (ex-ECJ) and the General Court (ex-Court of First Instance)”. Proceed with more caution than ever. 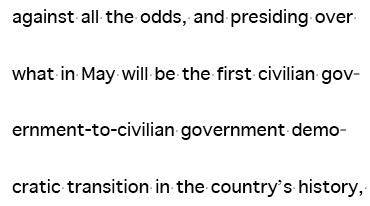 So that’s the first government-to-civilian government … hang on. 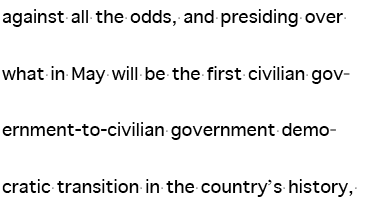 It’s the first civilian government democratic transition that is government-to-civilian in nature. No, wait. Ah: it’s the first civilian-government-to-civilian-government democratic transition in the country’s history. Even the bravest compound hyphenator tends to falter slightly after the third or fourth word.